The International Monetary Fund (IMF) has decided to give the Ukrainian banks R&R&R – that’s rest from regulation and refinancing. Inspection of the foreign exchange book, unwinding related-party credits, recovery of non-performing loans, and obligatory recapitalization, which were all conditions of the Fund’s 2014 Ukraine loan, have been relaxed. 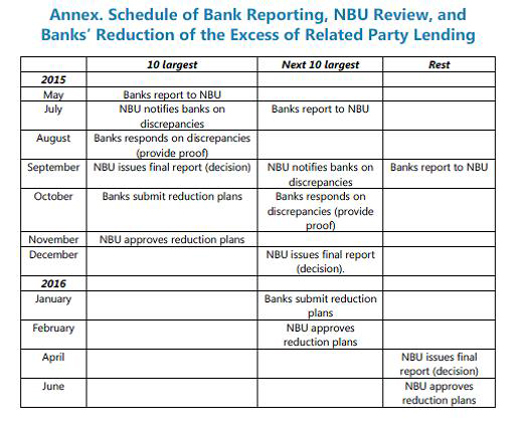 The new loan terms announced by the IMF last week, postpone reform by the commercial banks until well into 2016. In the meantime, the IMF says it will allow about $4 billion of its loan cash to be diverted to the treasuries of the oligarch-owned banks. That is almost one dollar in four of the IMF loan to Ukraine. The biggest beneficiary of last year’s IMF financing is likely to repeat its good fortune, according to sources close to the National Bank of Ukraine (NBU). This is PrivatBank, controlled by Igor Kolomoisky (lead image), governor of Dniepropetrovsk region and financier of several units fighting on Kiev’s side in the civil war. The taboo against admitting failure is one the IMF hasn’t broken. The new loan dossier reveals that IMF supervision of the Ukrainian banks, introduced last April and pursued through ten months, failed to staunch capital outflow from the Ukrainian banks; failed to recover value from the assets of insolvent institutions; and failed to require control shareholders to recapitalize their bank balance-sheets. These include Kolomoisky’s PrivatBank; Rinat Akhmetov’s First Ukrainian International Bank (FUIB, Cyrillic acronym PUMB); and Credit Dnepr Bank of Victor Pinchuk. The remedy, newly proposed by the IMF last week, lets the oligarchs off the hook, promising to feed their banks with public funds. That’s to say, IMF funds. 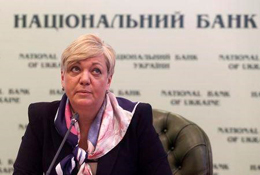 The NBU and IMF aren’t identifying the non-compliant banks. Without mentioning names, but plainly targeting the oligarch groups, the IMF announced last April, when it commenced its Ukrainian bank programme, that it was setting up “a central credit register at the NBU.” The objective was “to monitor credit risk concentration and enhance the monitoring of large business groups (including those related to bank owners), and become an important tool of off-site and on-site banking supervision.” The targets of the operation were to be given plenty of time and manoeuvre room. “The existing legal framework for the credit register will be revised by end-August 2014 in consultation with the IMF and WB [World Bank] staff, with the aim to become operational no later than August 2015” (page 69). Altogether, the IMF team working on Ukraine numbers 25 – 24, if Olga Stankova, a press officer who fails to answer press questions, is subtracted from the count. The team has been headed by Nikolai Gueorguiev, a former Bulgarian finance ministry official with a US university degree; he reports to Poul Thomsen (below left, in Athens with bodyguard) and Thanos Arvanitis (right); they are the director and deputy director, respectively, of the European Department of the Fund. 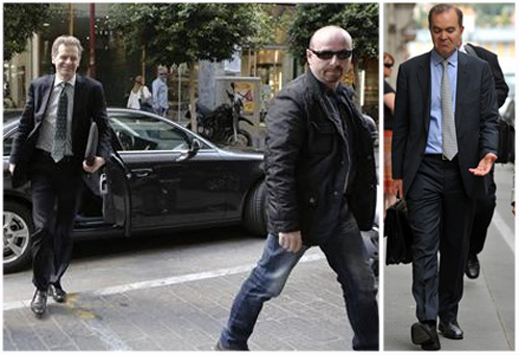 The reason for Thomsen’s bodyguard is that Thomsen, a Dane, has become well-known among the Greeks for his work supervising the IMF and European Union loan programme for Greece. Arvanitis, a Greek, is also well-known for success of another sort: he was ordered out of Hungary when the government of Viktor Orban leaked IMF loan terms, cancelled the programme, and in 2013 made a pre-term repayment of the IMF’s loan. Last April, Gueorguiev, Thomsen and Arvanitis reported to the IMF board that in return for phased payouts of loan instalments to Kiev, “we will monitor the banking system closely and send inspection teams to the field as needed. If a bank’s capital declines below the regulatory minimum, the NBU will require that the shareholders submit an action plan to recapitalize the bank, as well as impose restrictions on the bank’s activities in line with the law.” For a brief time, Gueorguiev answered the telephone at his Washington office to explain how well his scheme was going. For what he said then, click. For the record of how the IMF encouraged Ukrainian officials at the NBU and Finance Ministry – officials with records of past ties to Kolomoisky – to make PrivatBank the biggest recipient of emergency liquidity, read this. One of those officials, Stepan Kubiv, lost the governorship of the NBU to Gontareva when President Petro Poroshenko appointed her last June. 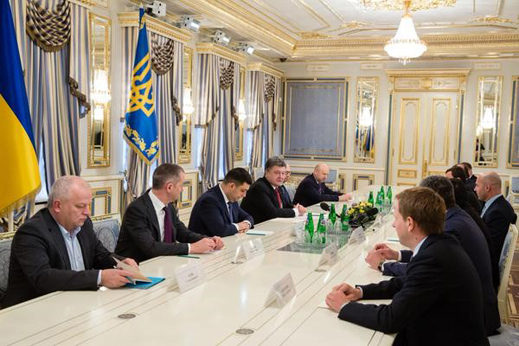 Six months later, in mid-January, Kubiv (below, first left) was returned to office as the government’s lobbyist at the Verkhovna Rada. Last April, according to the first loan papers, the IMF’s capital adequacy target for the largest Ukrainian banks was supposed to be 7% “within an overall capital requirement of 10 percent… under the baseline scenario” (at page 66). There’s a contradiction between proposing a regulatory scheme, and if it fails, allowing the banks to regulate themselves. This is the nub of the IMF’s problem in Kiev, say Russian bankers, and everyone else’s too. They say that Gontareva at the NBU and Jaresko at the Finance Ministry have no power to regulate their domains; if they had, they wouldn’t have been appointed. So it’s the bank owners who dictate to them, not the other way round. In the Ukrainian Letter of Intent and Memorandum which Gontareva and Jaresko have signed, along with Poroshenko and Prime Minister Arseny Yatseniuk, the IMF has been assured they have set up “a specialized unit to follow up on credit exposures with the banking industry of economically related groups and individuals (financial and non-financial groups).” Kolomoisky’s Privat group is the most powerful of them, and sources in Kiev expect it to dispose of the “specialized unit”, and the IMF’s new targets for the banking sector as it did last year’s. 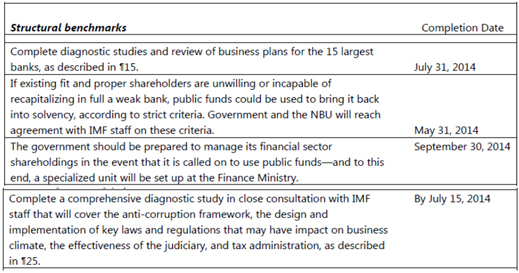 For comparison, here are excerpts from the IMF staff report’s table, “Prior Actions and Structural Benchmarks”. Source: http://www.imf.org/external/pubs/ft/scr/2014/cr14106.pdf at page 78. Source: http://www.imf.org/external/pubs/ft/scr/2015/cr1569.pdf at page 109. In the year elapsing between the two “actions” and “benchmarks”, the IMF confirms that nothing concrete has been done. Gontareva and Jaresko now say they will need another nine months, plus outside help, to find out what Kolomoisky, Akhmetov and Pinchuk could tell them directly, if they were asked and obliged to say. “With technical assistance from the IMF and the World Bank, by end-September 2015 we plan to have this unit [credit register] fully operational and with an action plan for the following 12 months, which would include the mapping of the largest 10 industrial and financial groups by end-December 2015” (page 86). Kolomoisky has been assured by the IMF that he is one of the few Ukrainian taxpayers to be safe from an increase in income tax. According to the memorandum of government intentions, “we will continue with measures, begun in 2015, to broaden the base and further increase progressivity of taxation. This will include steps to better detect and tax the income and wealth of high net worth individuals, drawing on technical support from the IMF.” Since Kolomoisky has publicly declared himself to be a tax resident of Geneva, and the Swiss authorities renewed his permit late last year, taxing him is a non-starter. For collateral, Gontareva has accepted a shareholding in the bank, plus an undisclosed number of airplanes owned by Kolomoisky, or by airlines associated with the Privat group. These airlines include Dniproavia (above, right) , Aerosvit, Cimber Sterling, Skyways Express, and City Airline. They are all bankrupt, and so the asset value is uncertain and the subject of creditor claims pending in several countries. For that story, read this. The latest PrivatBank financial statement, dated September 15, 2014, reveals the asset value of the bank attributable to shareholders was 22.8 billion hryvnia; that’s about $1.1 billion. Asset value has declined since then, and the bottom-line profit, which was negligible in September, hasn’t improved. About $1 billion was recorded in the September report as impairment for loan losses. Asked to say which accounting firm was employed, and what check Gontareva ordered for a conflict of interest which the accountant might have in relation to Kolomoisky’s businesses, the NBU refuses to say.